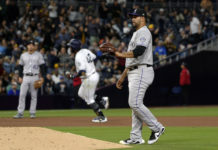 Colorado Rockies (44-43, fourth place in NL West, 6-4 L 10) vs. Seattle Mariners (56-32, second place in AL West, 9-1 L 10). Marquez (8.0 IP, 2 H, 1 ER, 9 K) was dominant in his last start Saturday in Los Angeles. He started the game with five perfect innings and managed to get the win. He will look to out-duel former AL Cy Young Award winner Felix Hernandez. Hernandez (5.0 IP, 6 H, 3 ER, 5 K) picked up the win in his last start Saturday against the Royals. Hernandez has been dealing with some back stiffness but is still expected to make the start Friday night. Freeland (7.0 IP, 3 H, 2 ER, 3 K) earned the win in his last start Monday against the Giants. 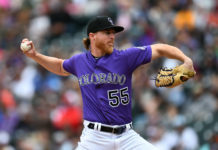 Freeland has played his way into being the ace of the Rockies pitching staff and has given Colorado consistency on the mound. His 3.25 ERA ranks best amongst Colorado starting pitchers and has pitched into the seventh inning in 10 of his last 17 starts. Recently, Freeland has started to receive some attention nationally. Paxton (8.0 IP, 2 H, 0 ER, 11 K) mowed down the Kansas City lineup in his last start Sunday and earned the win. Paxton has been the ace of the Mariners pitching staff and his 145 strikeouts rank fourth in the American League. He is only one of two pitchers this season to throw a no-hitter and did so against the Blue Jays in Toronto (9.0 IP, 0 H, 0 ER, 7 K). Senzatela (7.0 IP, 3 H, 0 ER, 4 K) won in his first big-league start of the year Tuesday against the Giants. Senzatela was called up recently to fill the void of Chad Bettis and delivered. 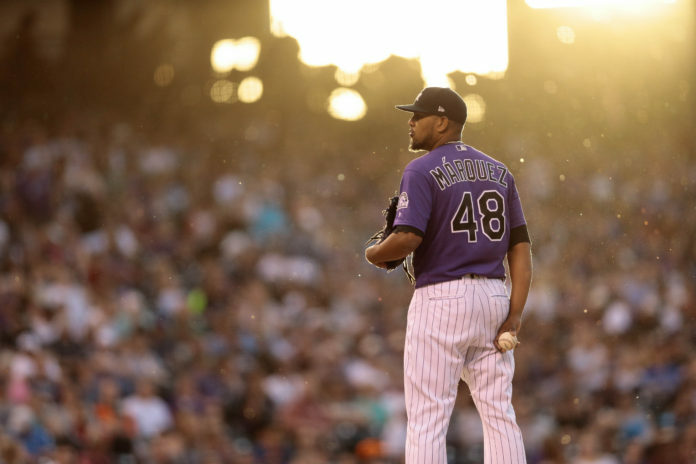 Another similar outing Sunday could force the Rockies hand in keeping him in the starting rotation. LeBlanc (7.0 IP, 3 H, 1 ER, 4 K) shut down the Angels in his last start on Tuesday. LeBlanc is 4-0 with a 2.89 ERA in 12 starts since moving into the rotation in early May. Nolan Arenado has been raking for the Rockies as of late (8/22 H/AB, 3 HR, 7 RBI). Arenado has been Colorado’s most consistent batter this year (.312 BA, 22 HR, 63 RBI) and will be right in the middle of the NL MVP conversation come fall. Trevor Story is playing like the best shortstop in the NL (.279 BA, 16 HR, 60 RBI) yet, he ranks just fourth in NL shortstop voting. Hopefully Manager Bud Black will be able to bring Story along as it was announced recently that Black will be on the NL All-Star coaching staff. Lately, Story has been a big reason why the Rockies are back to being over .500. (9/22 H/AB, 4 XBH) and has a career-best .279 BA. Chris Iannetta was the only firework the Rockies needed Wednesday in their 1-0 win against the Giants. Iannetta’s solo shot came off of Giants starting pitcher Andrew Suarez in the seventh. The catcher has played well recently (4/14 H/AB, 2 HR) and his veteran presence could play a big role for Colorado down the stretch. Kyle Seager has had five multi-hit performances in his last eight starts (7/21 H/AB, 3 XBH, 4 RBI) and has been a catalyst in helping the Mariners win nine out of their last ten. Mitch Hanniger has been a rising star for the Mariners this season (.269 BA, 17 HR, 62 RBI) and recently has done more of the same (5/18 H/AB, 3 XBH, 3 RBI). Hanniger has been battling a bruised right knee and could miss the weekend series against Colorado. Jean Segura has helped propel Seattle to their (56-32) record by hitting a .332 BA with 6 HR and 46 RBI. Colorado pitching cannot afford to allow Segura on base as he carries 14 stolen bases to go with his success at the plate. Carlos Gonzalez has been cold recently (3/17 H/AB, 0 HR) but has been able to give Colorado some production this season (.267 BA, 7 HR, 29 RBI). Gonzalez was brought back on a one year deal during Spring Training. Noel Cuevas (1/11 H/AB, 0 HR, 0 XBH) has cooled down since his call-up to the team and the recent call-up of Raimel Tapia could limit his playing time even more. Tony Wolters (0/4 H/AB) has seen the starting lineup only once in the Rockies last six games. Colorado is currently carrying three catchers on their 25-man roster and Wolters may struggle to see some playing time. His .140 BA this year has also played a big factor in his limited role with the club. Ben Gamel has been unable to find his grove during the Mariners hot streak (3/13 H/AB, 1 XBH), but has been a solid contributor for Seattle over the course of the season (.289 BA). Dee Gordon is just (5/24 H/AB) at the plate and hit a sluggish .248 in June. Guillermo Heredia (3/14 H/AB, 0 HR, 1 RBI) has struggled recently and over the course of the season (.235 BA, 2 HR, 10 RBI).